Small businesses are often referred to as the backbone of our economy. The Small Business Administration released a top 10 list espousing ways small businesses are important to the country. The list includes some interesting facts like 43 percent of all high-tech employment is created by small business and small firms with high levels of patents produce 16 times more patents per employee than their larger counterparts. The SBA also provides a lot of data on small businesses. Unfortunately, the SBA considers a small business to be 500 or less employees. For Idaho, this includes many employers that are very large, especially in our rural communities. Using data from the most recent tax files, this article looks at business with less than 50 employees and compares them to the rest to see how Idaho small business have fared over time. Total employment in Idaho is split fairly evenly between small firms and larger firms. Before 2000, employers with less than 50 employees had the majority of the state’s employment. Since 2000, with one exception at 2003, larger employers have employed the majority of Idaho’s workers. Both size classes were affected by the recent recession, but those with more than 50 employees registered year over year average employment gains in 2011. 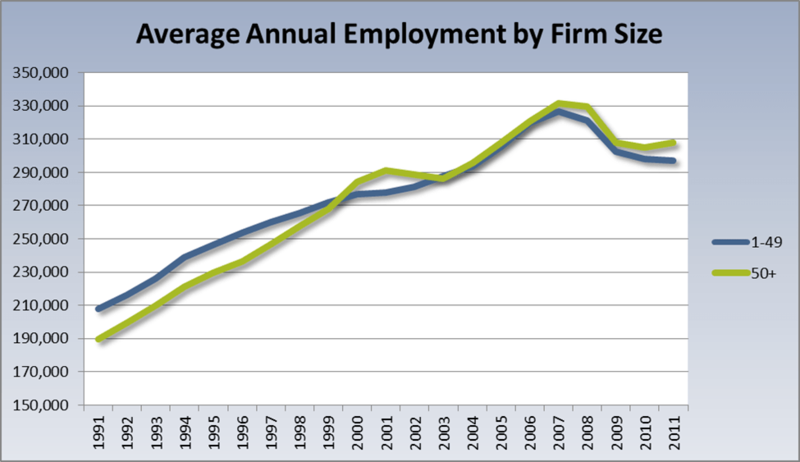 Smaller firms were down still in 2011, but only by 800. Looking at average wages shows some differences. 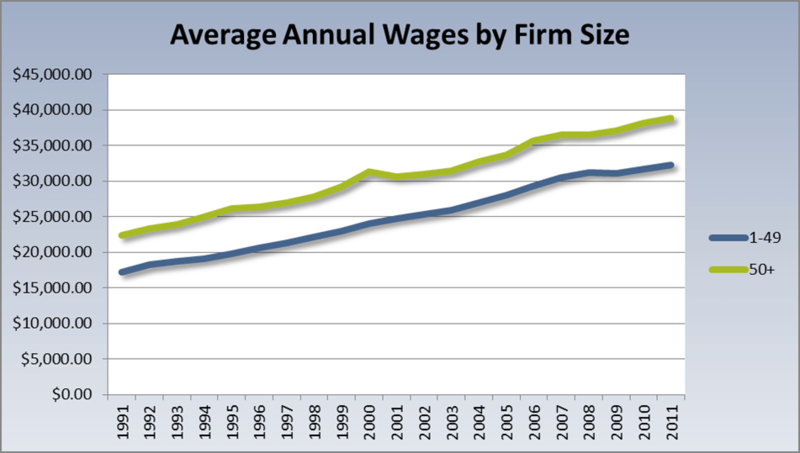 Larger firms have higher average wages then smaller firms for every year with data. On average, this difference is around $6,000 between 1991 and 2011. Large firms also had a small spike in their average wages in 2000. Outside of that, both lines show very similar trends over this time period. While total employment was split evenly and average wages were reasonably close, the number of establishments favors small firms intensely. More than 95 percent of firms in Idaho have less than 50 employees. This proportion was very stable during this time period. Small firms increased by 53 percent from 1991 to 2011 while larger firms increased by 61 percent. There are several instances where there is a difference in the growth (or decline) of an industries employment based on the size of the business. Small firms in agriculture, mining, wholesale trade, transportation and finance had second quarter employment in 2012 that was less than their prerecessions totals, while the larger firms in the same industry recorded improvement. Likewise, four industries had small business record growth while the larger firms declined. There are also notable instances where both firm sizes declined, but the magnitudes where different. Small firms in manufacturing are 9 percent off of their 2007 level while large firms are over 18 percent off. The construction numbers look very different, but more than 80 percent of total construction employment is in business with less than 50 employees. Small firms in construction declined 46 percent while large firms declined 41 percent. This entry was posted in Uncategorized on April 11, 2013 by Idaho Department of Labor.